Rolls-Royce Motor Cars proudly presents 102EX, a car that represents one of the most significant initiatives taken by the company in recent years. It is the world’s first battery electric vehicle for the ultra-luxury segment and continues a tradition of experimental cars running through the model generations. 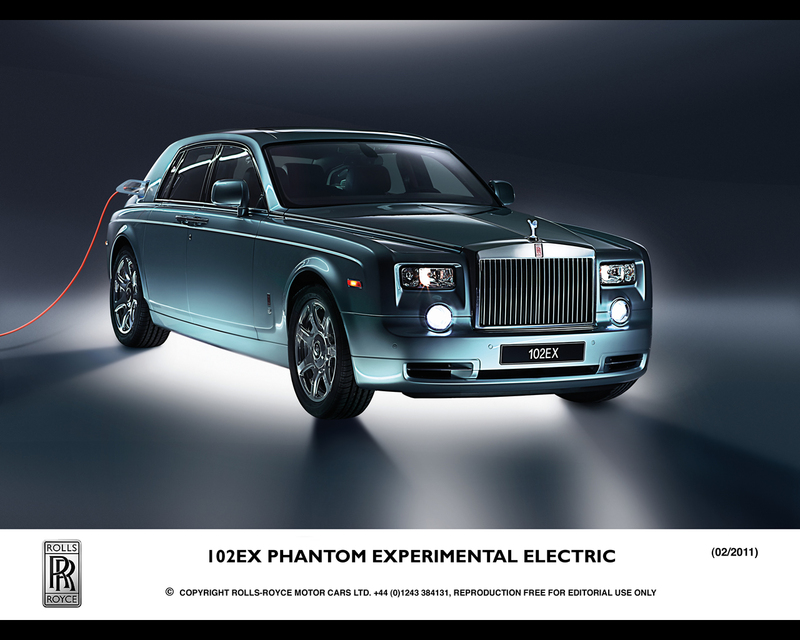 With 102EX, also to be known as the Phantom Experimental Electric (EE), it is the company’s intention to carefully test the opinions and reactions to alternative drive-train options of a range of stakeholders including owners, enthusiasts, members of the public and the media. Rolls-Royce 102EX – PHANTOM EXPERIMENTAL ELECTRIC 2011 features the car’s ground-breaking aluminium spaceframe, so important to dynamic prowess, as well as the sense of calm and tranquillity enjoyed by occupants. However, the naturally aspirated 6.75-litre V12 petrol engine and 6-speed gearbox have been replaced by a lithium ion battery pack and two electric motors mounted on the rear sub-frame. These motors are connected to a single speed transmission with integrated differential. 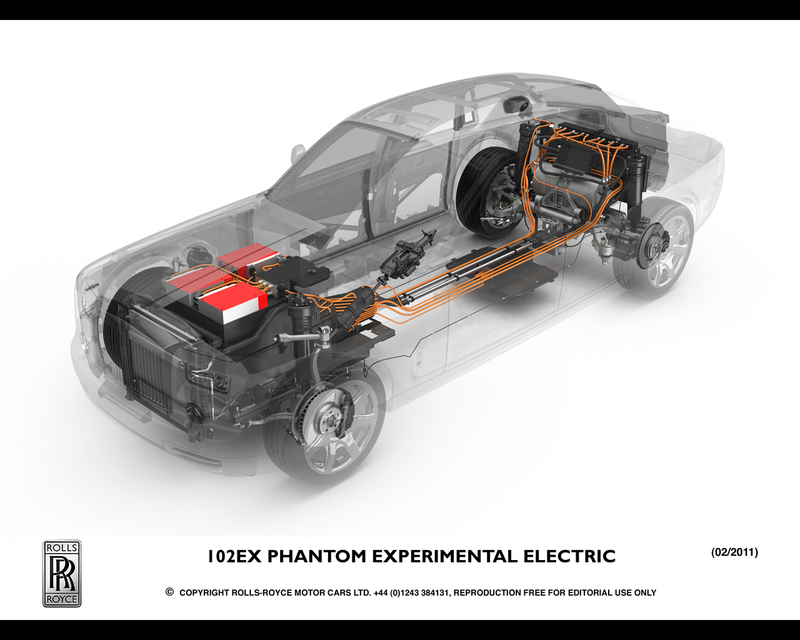 Each motor is power rated to 145kW, giving Phantom EE a maximum power output of 290kW and torque of 800Nm available over a wide band. This compares with 338kW for standard Phantom with maximum torque of 720Nm, delivered at 3,500rpm. The Nickel Cobalt Manganese battery chemistry holds around 230Wh/kg, a high energy density which is important in achieving an acceptable range between re-charges. Pre-launch tests suggests Phantom EE should run to a range of up to 200km. Delivered on an effortless wave of torque, 0-60mph will be achieved in under eight seconds (5.7 seconds in standard Phantom), with top speed limited to 160kph. This is the first application of the technology in a GKL++ segment (super luxury vehicles priced at more than €200,000) and the battery pack is thought to be the largest ever fitted to a road car. Evaluation of technology is an important part of the test programme. However, more fundamentally the car will seek answers to questions posed of Rolls-Royce owners: what their needs might be for the future considering factors such as range, performance and re-charging infrastructure. 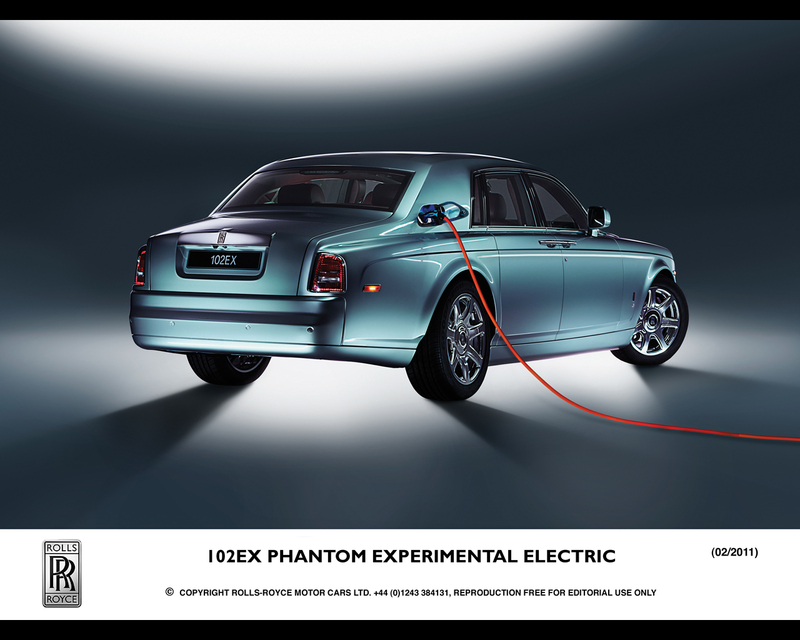 The feedback from customers – as well as media, stakeholders and enthusiasts via the website www.electricluxury.com - will prove essential in evaluating the appropriateness of battery electric technology for Rolls-Royce. 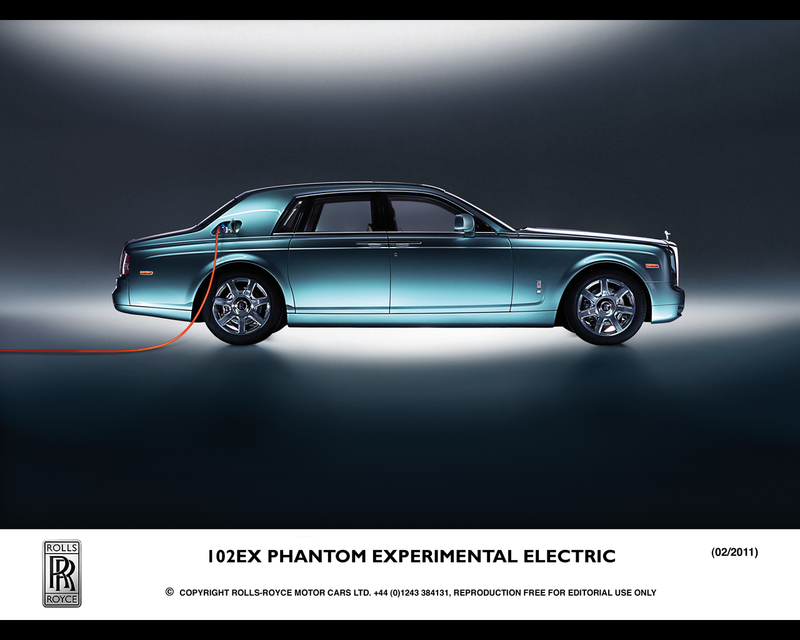 Re-charging is undertaken with a plug and five-pin socket which takes the place of the normal fuel filling mechanism for Phantom. The standard fuel filler cap has been replaced by a design featuring a clear window, displaying the RR logo and 102EX motif. The window frames rear-mounted, tricolour LEDs which present the car’s charging status. On start up, the socket is bathed in blue light. This begins to flash as charging commences. When completely charged, the display turns green, then flashing green as the solenoid is disengaged. A potential fault in the system is indicated by either constant or flashing red light. Charging can be halted via a switch located adjacent to the plug. 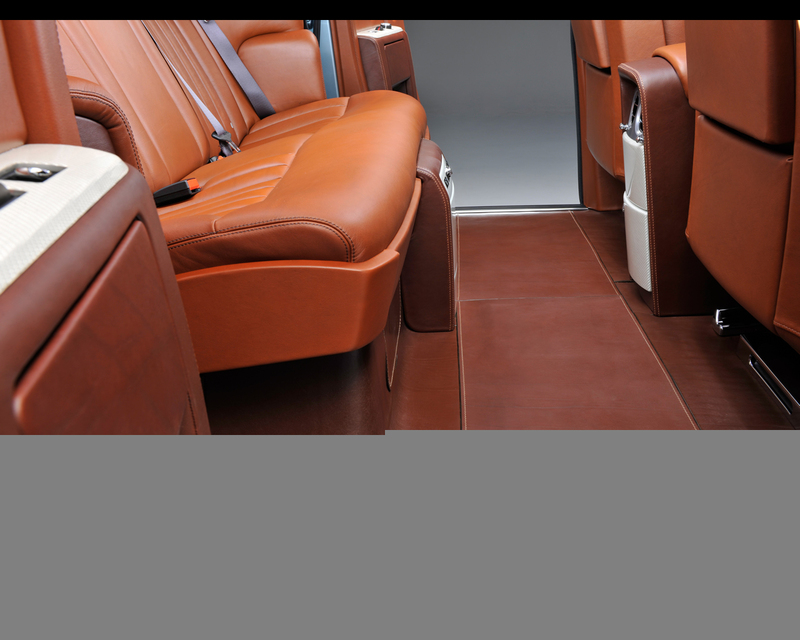 The process can also be operated inside the vehicle using controls accessed beneath the centre console, for example when induction charging is taking place. Phantom EE is thought to have the largest passenger car battery in the world. Peak current is 850A, delivered at 338V DC. Overall capacity is 71kWh. The pack is comprised of large-format NCM pouch cells. NCM (Lithium-Nickel-Cobalt-Manganese-Oxide) is a variant of lithium-ion chemistry that has particularly high energy and power densities. The Phantom EE battery pack houses five modules of cells, a 38-cell module, a 36-cell module, and three smaller ones of ten, eight and four arranged in various orientations within an irregular shaped unit. This resembles the overall shape of the original engine and gearbox. Each of the 96 cells was individually tested before assembly into modules to determine their characteristics and capacity. Sub-assemblies were further tested under load to verify that the power connections between each cell perform to specification. The electronic sensing units for each group of cells were tested and calibrated prior to assembly and put through a rigorous temperature cycling regime designed to provoke failure of weak components. The main electronic box, which contains the switching and control gear, was tested in isolation from the other components to verify correct operation. Three separate charger units (3kW each) are fitted to the battery, which allow both single-phase (20 hours) or three-phase charging (8 hours); for a passenger car this is unique. A fourth induction charger is also fitted to enable wireless charging, a technology being trialled in Phantom EE. The battery pack would be expected to last over three years were it to be used every day. Part of the programme however will be to test this assumption in a real world environment and deliver a more robust answer to the question of battery lifespan. Concerns about lack of available re-charging infrastructure in towns and cities are well documented and critics of electric motoring point to the additional inconvenience of trailing cables connected between power source and vehicles. 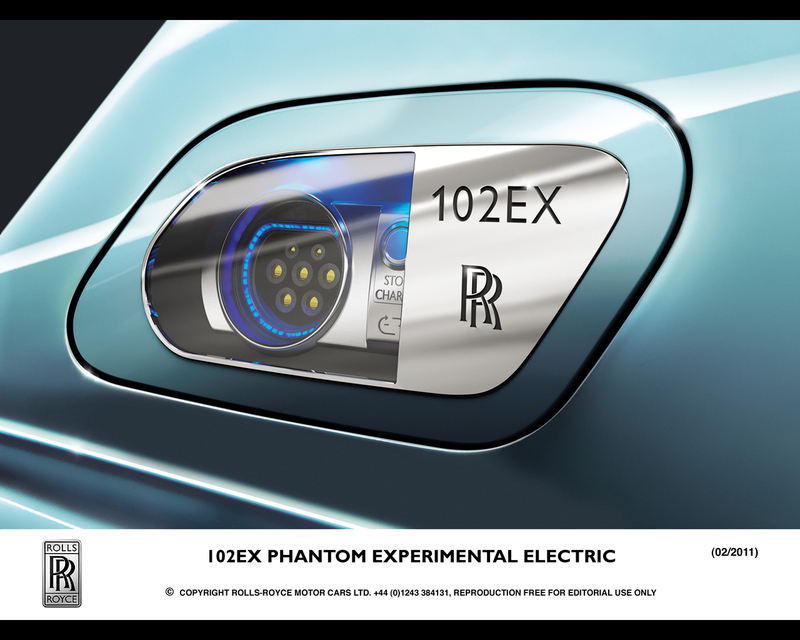 To present Rolls-Royce owners with a vision of a potential solution to these problems, Phantom EE is testing a technology called induction charging. This allows re-charging to take place without any physical connection, delivering greater convenience for owners and hinting at the potential for a network of remote charging facilities. 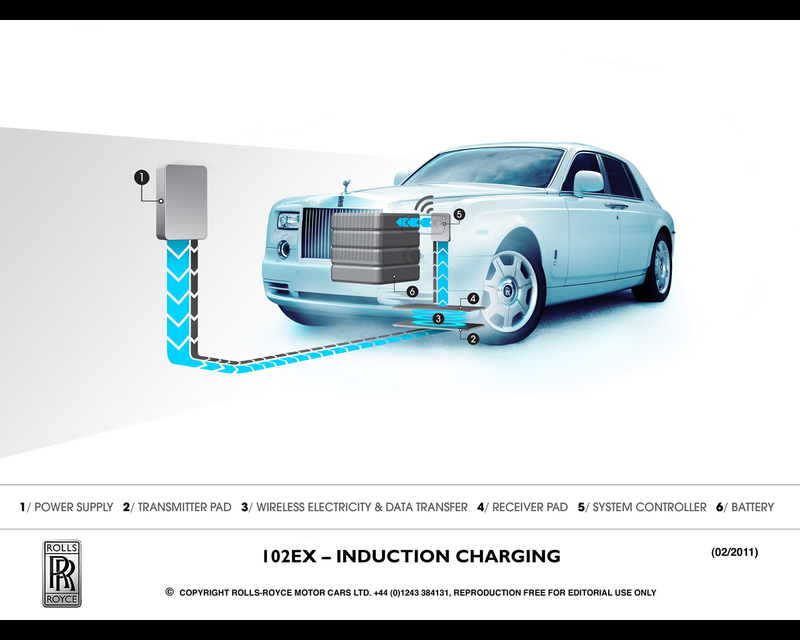 There are two main elements to induction charging; a transfer pad on the ground that delivers power from a mains source and an induction pad mounted under the car, beneath Phantom EE’s battery pack. Power frequencies are magnetically coupled across these power transfer pads. The system is around 90 percent efficient when measured from mains supply to battery and it is tolerant to parking misalignment. For example, it is not essential to align the transmitter and Phantom receiver pads exactly for charging to take place. While pads are capable of transmitting power over gaps of up to 400mm, for Phantom EE the separation is in the region of 150mm. The coupling circuits are tuned through the addi­tion of compensation capacitors. Pick-up coils in the receiver pad are magnetically coupled to the primary coil. Power transfer is achieved by tuning the pick-up coil to the operating frequency of the primary coil with a series or parallel capacitor. The pick-up controller is an essential part of the technology because it takes power from the receiver pad and provides a controlled output to batteries. It is required to provide an output that remains independent of the load and the separation between pads. Without a controller, the voltage would rise as the gap decreases and fall as the load current increases. The transmitter pad has been constructed to shield magnetic fields to prevent EMI egress to bystanders and the system operates well within internationally agreed limits.